Marie Colvin was a legend among war correspondents. Her tenacious reporting from conflict zones areound the world and willingness to put herself in harm’s way to document atrocities being committed by the powerful brought her to the pinnacle of her profession. But it was also this determination to show the human cost of war that ultimately led to her death in 2012, when Colvin was targeted and killed in Homs, Syria while reporting on how civilians were suffering from the siege of the city. To understand more about the film and discuss the importance of journalists telling untold stories, the Reporters Committee for Freedom of the Press spoke with Heineman, Rosamund Pike — who portrays Colvin in the film — and Colvin’s sister, Cat. Reporters Committee: How does the film show the importance of a free press and journalists holding the powerful accountable? Cat Colvin: I’m really glad that the film brings this issue to a broader audience in a way that I think will reach a lot more people … It’s always a struggle to get attention for what I consider to be the really critical issue of getting firsthand accounts of these wars that are occuring. Without journalists there on the ground, dictators can operate with impunity. As you see with the Rohingya people and in Syria now, there’s a real dearth of news. So I think the film will inspire people to learn more and understand in a more personal way what journalists go through and the risk that they take to bring news to our door. Matthew Heineman: My background is as a journalist — as a documentary filmmaker — so it’s just something that is very personal to me. Marie was a legend and although I never got to meet her, obviously I knew who she was. And for me, to film this is hopefully an homage to her, the importance of journalists, the importance of a free press and the importance of people out there fighting for the truth in a world of fake news, soundbites and dictators spewing propaganda. Hopefully, the film is a reminder of the importance of journalism as the bedrock of a free and independent society. Obviously, the film is many many more things to me, but that’s one of the things it stands for. Rosamund Pike: It’s so great to see that it’s not just a job, journalism. I think it’s probably true of most journalists that there’s a tremendous passion that drives the profession. I think Marie had a huge passion, which is infectious and I think hopefully comes across in the film. I think she understood that in any conflict, there are many narratives up for grabs. And if you only let one narrative be heard, then alternative versions as people grapple to try to understand a situation don’t get out there. So, unless you’re actually as close as you can get — that was her philosophy — you’re never going to be in a position to really change people’s minds. She always went further, went deeper. She found that you found truth by embedding yourself with people, sleeping where they slept and eating their food. I’m proud, too, that the film shows a journalist filing copy, that we actually see the whole business — not just the getting of stories but the processing of what you’ve taken in and how you transmit your feelings, what you’ve seen, to the world. Sometimes a film might think that’s the boring bit. I don’t think that’s the boring bit, certainly not in the way that Matt has captured it. What drew you to the story of Marie Colvin in particular? MH: I made a documentary called “Cartel Land” and afterward I was approached by a number of people about making narrative films. I was sent a bunch of scripts, none of which I particularly cared about. And then when I received an early draft of this script, it just spoke to me. Not necessarily the script that I read, but the idea of making this film about her, making a film about journalism at this time. And then the more and more I dug into research, the more and more I got to know her through her words and through her friends and her colleagues. I think I sort of fell in love with her and felt a huge responsibility to get the story right. What do you think Marie Colvin’s legacy is in terms of what journalists now and in the future can learn about how she questioned the powerful and held them accountable? CC: I’ve talked to so many young journalists who have been inspired by Marie. When you see what’s happening in Syria … it’s just gotten worse. But I do feel a lot of hope with the journalists coming up, especially young women who are inspired by Marie’s story. Of course, I worry about them risking their lives to get the news. But I actually think that is one of her greatest legacies — and something she’d be really proud of — because she always cared a lot about helping not just her colleagues but younger journalists. That effort she made to include younger journalists in her contacts and the way she did things was very unusual in her career. One of the projects we’ve done since her death is to start a school for international reporting: The Marie Colvin Center for International Reporting at Stony Brook. And it’s really inspiring. The other important part of her legacy is the attention that this film and the documentary that’s coming out, “Under the Wire,” brings to the victims of war. That was really what she cared about more than anything else. I don’t feel that she’s died in vain. She died too young, and I think if she could have chosen the way to die, this probably would have been it. It was quick, it was doing something that she loved, it was too soon, but we’ve talked a lot about fear and what she was really fearful of was losing her other eye or becoming incapacitated. So I think she’d be very surprised at the legacy. I’ve always been extremely proud of her, but I’m really proud of what she’s left behind. RP: It’s interesting, what you’re saying about the young journalists, I’ve experienced that, too. I was at a screening of “Under the Wire,” the documentary that follows that mission into Homs and beyond, and the number of young women that came up to me with this look in their eyes trying to see if I understood what she meant to them. You know that thing where somebody is trying to make sure that you get it … do you get what a legend this woman was? And I do. They’re very excited about the film and they want to make sure that I’ve understood that she was “it” for them in their career — looking forward that was what they all aspire to. I could feel that she was the mark that they were judging themselves by. MH: In an earlier draft of the script, which is sort of a natural Hollywood inclination, there was the young hot reporter who was competitive and rising up and sort of a mirror to her mortality. But after talking to her friends and her colleagues, it became quite clear that it was literally the polar opposite. She was so generous and loving and kind and giving to younger journalists in a field that is quite cutthroat and where people don’t share sources, people don’t share information, people aren’t collaborative; she was the opposite. It was fun changing that character and making her much more nuanced and interesting and somebody who looked up to Marie while also being ambitious herself. What do you think this film shows about the challenges that foreign correspondents in conflict zones face when reporting? RP: I think when Marie started out, the dangers were the dangers that you would imagine of being in highly dangerous places. As she said the thing is that ‘Where the story is is where the guns are.’ But obviously, in the latter years of her career, journalists became targets, which at the beginning of her career they were not. RP: And feeling sure that that would protect her. So at the beginning of her movie, which is taken from her own account of that happening, is when she decided to stand up and say ‘I’m American and I’m a journalist’ — that was when they opened fire again and she lost her eye. We want the film to convey the cost of getting these stories. MH: As civilians, it’s so easy to read an article, take it at face value and then sort of put it away and spill your coffee and go for a run or do whatever you do and forget about it. But you don’t appreciate the enormous work, enormous danger and enormous cost — personal, physical and mental — of telling these stories of going to these places. That’s what I really wanted to explore — it was one of the many fabrics that motivated her. It wasn’t just one thing. She was not a thrill-seeking adrenaline junkie, as a lot of war correspondents are, sort of in a cliched way, put in a box. She was so much more interesting and nuanced than that. To explore that was really fascinating to me. 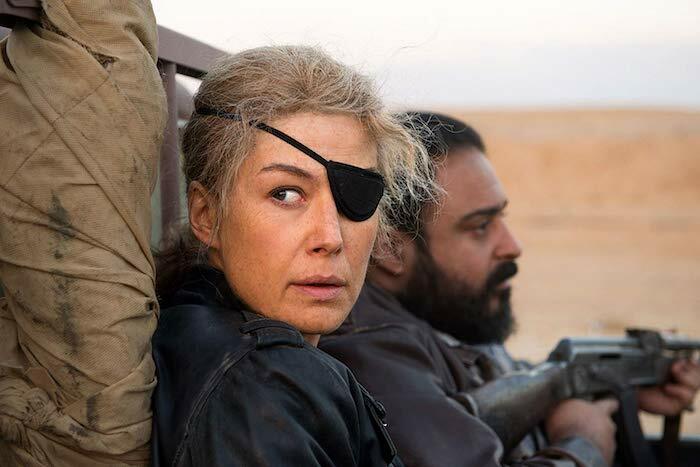 “A Private War” will open Nov. 2 in New York and Los Angeles, with a wide release on Nov. 16.